What kind of bag do you need for law school? I am not sure why but this question drove me nuts before starting school. Should I use a bookbag? Should it be a professional tote? I went on a mad search for the elusive "perfect law school bag". I bought and returned about 6 from TJ Maxx (I worked there at the time) and I still wasn't pleased. I ended up with a backpack and big leather tote before starting school. 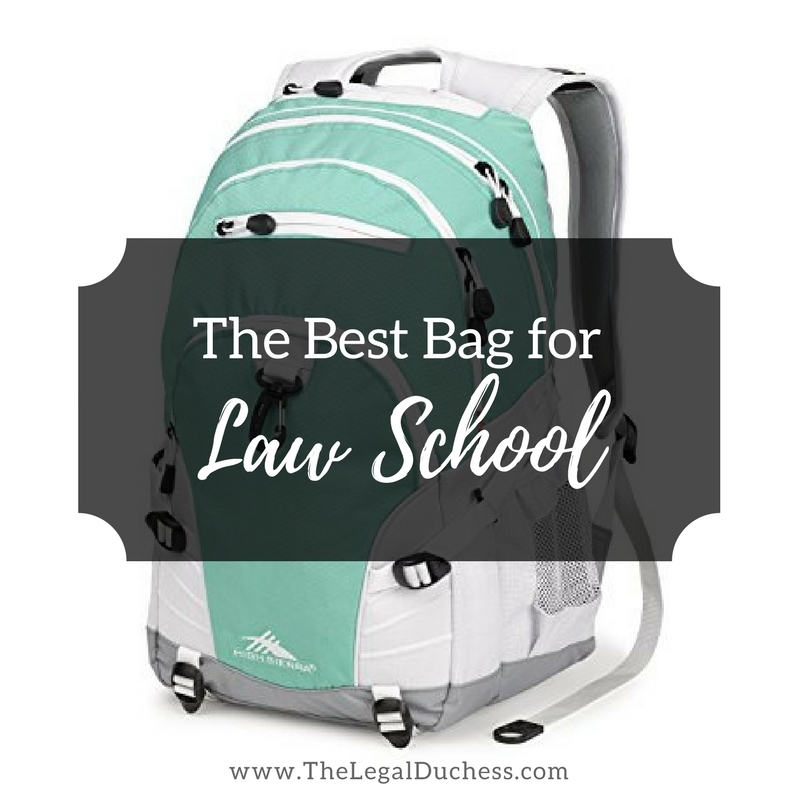 I have made some adjustments through my time as a law student and now that I am a 2L, I feel fairly confident that I know what the best bags for law school are... or at least what works for me and what I see working for some of my classmates. I think every law student needs a bookbag of some sort. Law school books are stupid heavy and you also need to carry around a laptop, writing utensils, notebooks, binders and all sorts of other stuff if you are type A and super prepared for any situation like me. This will not all fit in a purse so a "bookbag" of your chosen variety is a must. There are several varieties that I have seen around my law school: traditional two strap bookbags, rolling bookbags, weekender type tote bags and large tote bags. I personally carry a large two-strap bookbag and my everyday purse to law school every day. My bookbag has plenty of space for all my books as well as a special laptop pocket. I have linked additional styles and ideas- everyone is different and you have to choose what works best for you. There is no wrong bag to carry books- if you have a bad back, get the rolling bag. Do what you need to do! A simple, easy bookbag with plenty of space, comfortable straps and a designated laptop area is what you should look for if you chose the standard two-strap variety. Why carry books when you could roll them? Many of my friends with back problems use a small carryon bag as a rolling bookbag. I haven't switched over yet because I prefer the freedom of a two-strap backpack but I do envy the lack of back ache that this would cause. Plenty of space in this! A few of my friends carry this exact bag and they love it. It has tons of space and is easy to carry. It's a "weekender" style but it works for the day to day cargo you have to haul to and from school. An extra large tote is never a bad idea... I have a few friends with this exact tote and they love it- they throw anything and everything into this cavernous bag and seem to never run out of space. Law school is full of professional events so having a professional bag is important. I personally have a navy blue leather tote, cognac leather tote and black leather tote so that I have something that matches any outfit I wear- these are all simple, sleek leather tote bags with a zipper and enough space to carry my laptop, a notebook, my portfolio, keys and a wallet. These are perfect for job interviews, internships, etc. I also recently ordered this monogrammed beauty because my black leather tote is getting a little too worn. Isn't the monogram just adorable? I splurged for the matching wallet because life is short and I love scallops. This one is reversible!!! Black and Cognac for the price of one! It is a great staple for the professional wardrobe to have a simple leather bag. A great navy option for those who want something a little different or wear a lot of navy. For those like me who love the look of a Longchamp but don't like the pricetag, what a great option! Boys, I did not forget about you. My guy friends from law school all have nice leather messenger bags for professional internships and interviews. They look very classy and trendy at the same time. Here is my suggestion based on what they carry. I hope this helps you to narrow down what bags to have for law school. It seems trivial but it is also important to be prepared with the right stuff. Thank you soo much for this piece. Helps me a lot since I'm going to start my degree in law this April. I don't have to worry on 'which bag is the best' since I've your post to guide me!!! Thank you, again and all the best in your future endeavours.